Year 2018 marks the brand-new page of DSG Energy Limited as being the only Shell Gas licensee in Hong Kong & Macau. 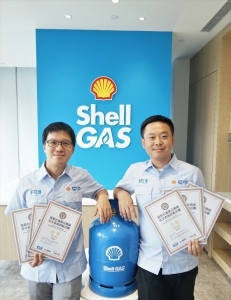 By upholding Shell Gas spectacular performance in both safety and business achievement, our team has once again obtained the most GOLD awards in the industry-wide and government recognized safety performance scheme named “LPG Cylinder Distributor Safety Performance Recognition Scheme (SPRS)” for 3 consecutive years. Simultaneously, we have continuously extended the record of achieving 10 consecutive years with over 5 million man hours Lost Time Injury (LTI) free milestone since 2008. These have once again proven that our team is always the pioneer and taking the lead in LPG industry. As the pioneer in the LPG industry, we possess great leadership from the managements, together with the team’s dedication and effort in shaping Shell Gas as a premium brand. To achieve this success, we provide account servicing and professional advice, including planning to execution; consistent guidance and nourishment in safety; strengthen distributors’ CVP for long term growth; and motivating distributors to create an astonishing image to customers. The stated elements help shaping DSG as a role model and showcase to build exceptional image in safety which we strongly proud of. In brief, a total of 180 showrooms have been audited by third-party independent auditing companies and DSG Energy distributors successfully obtained two third Gold awards, covering most of the districts in Hong Kong, and DSG Energy distributors are the only Gold awardees in 8 of the districts, with most of them have been receiving Gold awards for 3 consecutive years, proving that we and our distributors are leading in gas safety performance among the industry. Moving forward, we are committed to provide reliable service with high safety standard, bringing in new extraordinary customer experience via innovation, inspiration and sustainability to differentiate and win against competitors. Inevitably, the leadership and collaboration across different departments to work as “One Team” is essential to strive for continuous successes in future.